THANK YOU to all who came out this weekend to make it the funnest Syracross yet! It was a beautiful day and we definitely had a record turnout of racers and spectators! Spooky music, Halloween costumes, and the usual waffles, coffee, beer, and bonfire were on point. How much fun was it to hear the Fat Tire mass start rumble? And cowbells ringing through the woods? To top that, we were able to raise $90 for Pedal to Possibilities! 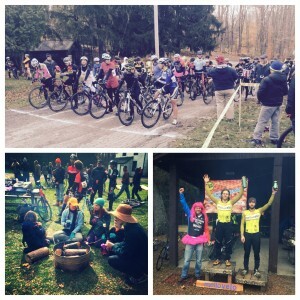 Results are up and once again thanks to all who came out and to all our amazing VOLUNTEERS who made it happen! Be sure to check out photos as we post them to Facebook and on Instagram #syracross. Thanks to our Syracross 5 sponsors (Kona, QBP, Kali Helmets, Middle Ages Brewery, Peaks Coffee, Cat Ears), Bike Loft East Neutral Pit Support, and to Hollis Funeral Home and the rest of our Mello Velo Racing team sponsors too!